In partnership with MASS Collective and Robell Awake, TNS is excited to offer a woodworking program at a leading Atlanta maker space. Students will learn fundamentals and advanced woodworking techniques, and will design and craft their own wood-based products. This class takes place at MASS Collective, 364 Nelson St SW, Atlanta, GA 30313. 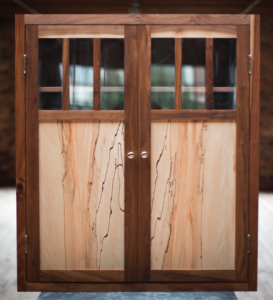 Robell Awake is a woodworker and teacher based in Atlanta. He works out of MASS Collective, a makers cooperative in Castleberry Hill. Passionate about traditional methods of wood working, he strives to craft each piece by hand, with minimal machine use. Robell grew up in Marietta, Georgia, the son of Ethiopian immigrants. Before woodworking, Robell worked as a bike messenger for several years. He then moved into in-house construction work for architects, including welding and carpentry. Under the tutelage of these architects, he began developing a serious interest in design and craftsmanship. 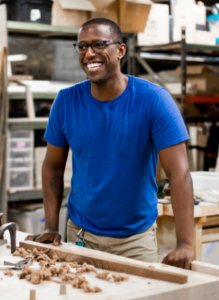 Through apprenticing with a local furniture maker, attending an intensive course at The North Bennet Street School, and countless hours in the shop, Robell continues to cultivate his craft.